This guide provides information about race days to both new and returning crew families. 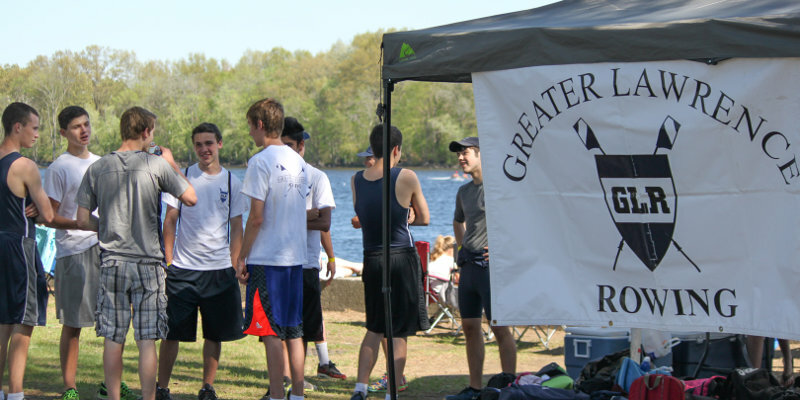 Regattas are a great way to learn about the sport and meet the other families on the team. 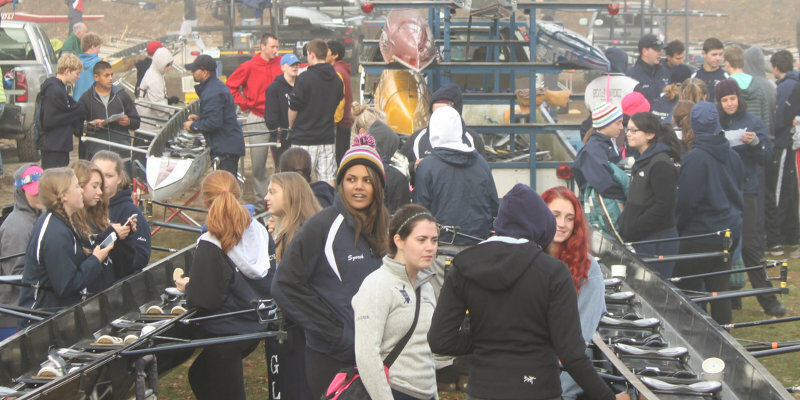 It is best to plan for a full day of fun for both the rowers and the racing families. Races are usually spread throughout the day and often the actual race is the shortest amount of time involved in the athlete’s workday at a regatta. 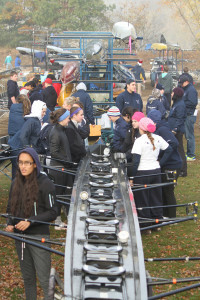 Rowers need to unload the trailer, rig the boat, race, cheer each other on, eat a lot of food after their race, de-rig, load the trailer and then unload back at the boathouse. It is a full day! The size of the event and number of teams competing dictates how long the day will be. Athletes usually need to be at the regatta early in the morning. Each team member is expected to be there throughout the day and then return to the boathouse after the event to help with getting the boats and gear unloaded. The coaches are dependent on communication about the schedule from the race hosts/sponsors and often this information isn’t available until late in the week. Although every regatta plans to be on time, water conditions, weather and unplanned glitches happen so it helps to be flexible. Every attempt is made to safely hold all the scheduled races so sometimes there are delays or last minute changes during the day of an event. Your rower may not know which boat he or she will be rowing in until a few days prior to the event. Coaches need to monitor performance and will switch things up throughout the season. Each rower arranges their own transportation. Don’t forget to check the GLR website for directions. Coaches will tell the rowers what time they need to be at the race venue (usually several hours before their race). Encourage your rower to connect with other rowers in their boat so that families can carpool – one family can get the kids to the race for the designated arrival time and stay through race time, another family arrives in time to see the race and then stay until the end to bring the kids back to the boathouse for unloading. Larger regattas will charge for parking so plan on bringing some cash. 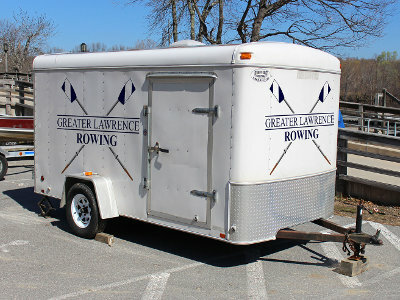 Look for our tent with the Greater Lawrence Rowing logo on it!! Its a large blue tent with smaller pop up tents set up to shelter the food tables and our rowers. It is a very nice place to hang out, meet other families, ask questions, have some coffee/food, and cheer on the team. If you’ve never been to a large regatta, it can be a bit overwhelming at first, but you will learn quickly, and it is amazing to see the organization and support that the parents, coaches and event sponsors give to the rowers. Also, please pay attention as you walk around a regatta, and remember that the people carrying the boat have the right of way – boats weigh a lot, and they can’t dodge you! Be aware, and be prepared to hop out of the way and/or duck. Layers of clothing – Sometimes it can be very cold and windy by the water, other times it is nice and sunny. We’ve also spent time in the rain so don’t forget your umbrella and/or waterproof gear. Binoculars – It is hard to tell which boat your kid is in otherwise! Look for the Blue & White GLR “blade” which is the flat part of the oars. Cash – for parking at the larger events. At the bigger regattas you might want to have a credit card on hand too if your rower talks you into buying a regatta T-shirt or other gear available. Water bottle – Please label! “Many hands make light work!” The team relies on parent volunteers to both provide the food to feed the rowers and their families, and the labor for managing the set-up, on-sight organizing of food/cooking and then the cleanup at the end of the event. Every bit of help, regardless of how small, is greatly appreciated and we have been fortunate to have a wonderful community of team families who consistently show their support and pitch-in at every race. We use SignUpGenius to manage food and volunteer assignments for each event. Usually mid-week before races, you will receive an email with a link to SignUpGenius.com requesting you to 1) sign up for something on the food/supply list and 2) sign up for a race day volunteer job. This system is designed to provide food for all the rowers and families to eat and drink on the long Regatta days. You will understand why you are asked to bring food every regatta when you see the amount of food that is consumed! Our first priority is feeding the rowers and they require a LOT of calories and liquids after races. However, everyone has been extremely generous during past seasons and we anticipate that the same will happen every year. As a result, regatta food has been plentiful for the GLR cheering section of families and friends too. The sign-up list will give you suggestions for different food and beverage items and an approximate number of rowers participating. Don’t worry, we are not asking anyone to prepare any dish for 100+ kids. Instead, we divide up the items so that no one is overburdened. Rowers can eat as much as an hour before their race but what and how much they eat is very important. Simple carbohydrates and water is fine – 100-200 calories at the most. 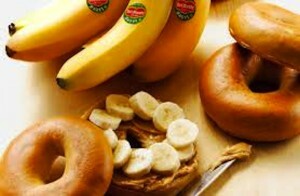 A breakfast bar, banana, or 1/2 a bagel are a few examples. They should have a hearty breakfast 3-4 hours before their race though. Once their race is over, they are usually VERY hungry. 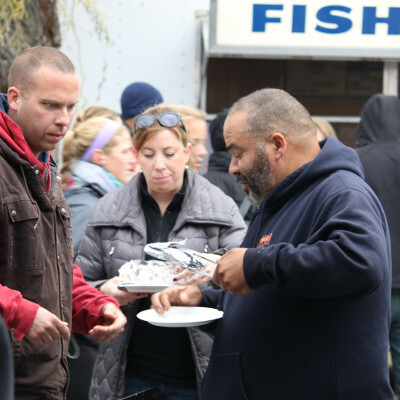 Volunteers staffing the event will stagger different food items to ensure that there will be food left for all rowers, especially those with races late in the day! Sign-up for the food /items you are willing to bring to coincide with when your rower is racing. Don’t volunteer bagels or a breakfast casserole if you aren’t arriving until late morning or afternoon for your rower’s race. We strongly encourage healthy food & beverages for breakfast, lunch and late day snacking. 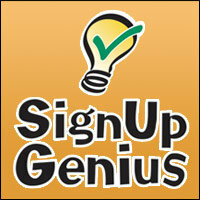 Suggestions will be included on SignUpGenius but creativity is always welcomed. We have grills to cook or reheat casseroles. Aluminum pans that fit into chaffing dishes work well if you bring an item that needs to be kept warm. Hot items can also be brought hot and kept warm layered in newspaper in an insultated cooler until ready to serve. Ice and coolers are used for cold items. Label any container that you wish to bring home and remind your rower to take it with them if you won’t be there. Disposable recyclable containers work well but the amount of trash we leave is always a concern. Encourage your rower to bring a reusable LABELED water bottle to the regattas. We are trying to create less waste with the volume of half-used disposable plastic water bottles left at the tables, and will not be stocking cases of water bottles. Along with food and supply requests, we use SignUpGenius to organize volunteers to set up the tent and tables, organize the food throughout the day, grill, break down the tent and load the trailer when the day is done. You do not need any experience with any of these jobs and during the first several regattas volunteers who are veterans will help new volunteers. Don’t hesitate to pitch-in! We spend a fair amount of time with one another along the river and rower families are a friendly bunch! We have a trailer filled with all of our supplies, cooking gear, tent, and tables. We need volunteers who can pull the trailer to each regatta. Sometimes the trailer is picked up from the boathouse on the Friday before the race and sometimes the morning of the race. Coaches will work out the details with the family volunteering that week. If you have a truck/SUV with a hitch and are willing to transport the trailer to and from the regatta location, please sign up on SignUpGenius!! The trailer needs to arrive at the regatta well before racing begins and returns to the boathouse after the day wraps up. Put up the Tent(s) – tent, instructions and all parts for set up are clearly labeled and located in the trailer. Unload the trailer with our supplies for the day. Organize food donations, supplies and paper products. Breakfast items in one area, lunch and drinks in another etc. Basically we are setting up a “buffet” for the day and any logical grouping of items is helpful. Fill hot and cold water containers. Set up grills and cooking areas. Put ice in the coolers. Designate an area/tent next to the food tent for the rowers and their bags. Organize the food and manage donations as food is dropped off. Stagger & keep track of food dishes to ensure that all rowers have something available to eat after their race. Refill dishes, make sure there are paper goods and serving utensils, and restock drinks. Assist in keeping the food area clean & take full trash bags to the dumpsters on the regatta grounds. Grillers– Take a shift cooking, warming donated casseroles and keeping track of propane needs. Disassemble the tent, make sure labels are included and instructions are ready for the next regatta. Take down tables, gather supplies and reload all reusable items into the trailer. Find someone who is willing to take food items home to freeze and bring back next race (e.g. hot dogs, fresh bagels, etc. ). Give away remaining perishable food to anyone who wants it. Supervise rowers and families to pick up and throw away any trash. After reading this list you are probably thinking this is a ton of work but once again, remember that the phrase “Many hands Make Light Work” really does apply to our team. 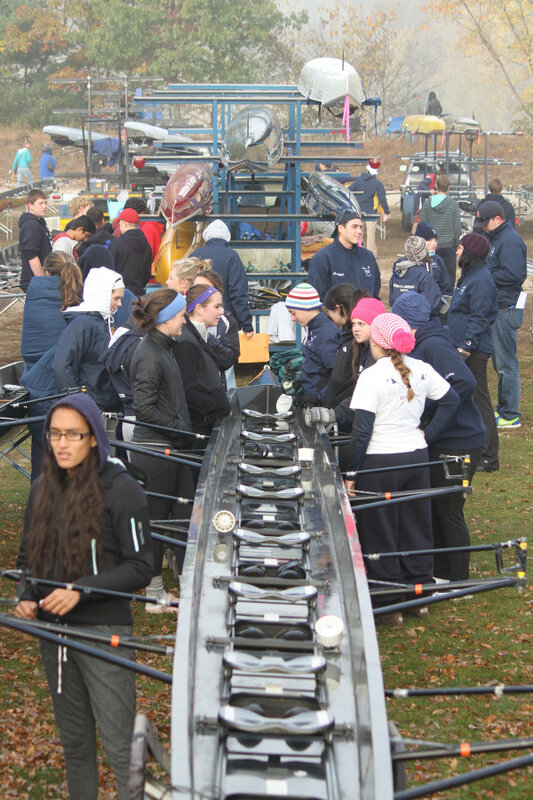 Many families attend regattas to support our rowers and there are always plenty of people who help. No one is ever left handling a task without the support of others.